Albee had been living in Paris that summer, working for L'Etoile and staying in a rather shabby pensionne. It was seven flights up and down every day but Albee loved Paris so he hardly minded. "What is that, Madame Le Fouquet?" he had asked when he moved in, pointing to the metal cage suspended by wires between floors. "Oh, cette chose, Monsieur?" answered his new landlady. "It hardly works, a little bit de temps en temps. Forget it." And so Albee forgot it until one very hot day just before his internship was about to expire, Albee returned to the pensionne exhausted. Unable to face the stairs, he climbed into the cage and began pushing buttons. "Madame Le Fouquet, what is this?!!" he cried out. "The walls are closing in on this elevator!" "Ce n'es pas un ascenseur, Monsieur Albee! shouted the landlady. "It is a giant electronique cheese grater! Don't forget, c'etait France!" I thought maybe going a little cosmopolitan might help boost my Friday Fictioneers readership this week, especially after bombing royally in last week's effort to make a link to a Beatles' song the capper to my post. That's why this week, folks, we're all wearing turtlenecks and sipping wine in a cafe in response to the picture prompt, courtesy of Nouveau Old Formerly Cute. What's not to love here? 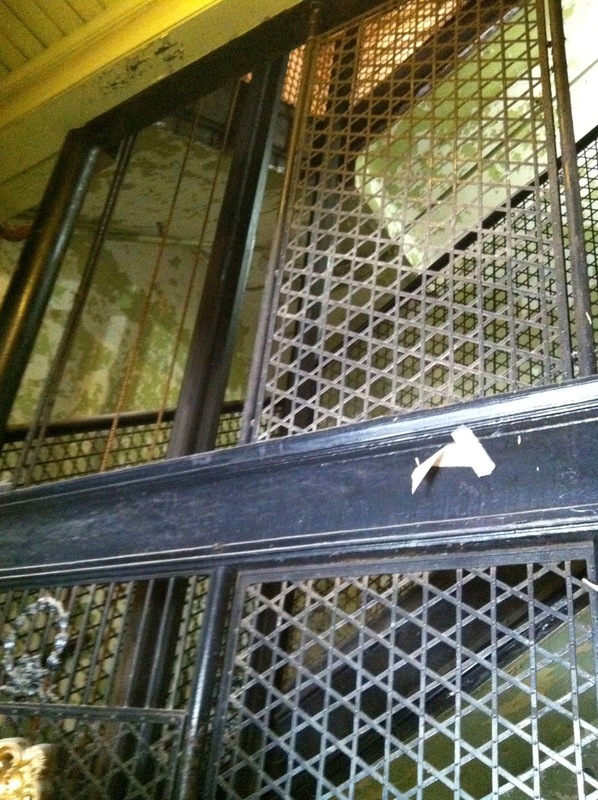 Where will the elevator or stairway above take you when it comes to the other Friday Fictioneers? Cliquez ici pour en savoir. Now, pardon me, I have to get Albee out of the cheese grater before he winds up atop a Ritz Cracker. I'll have a large bottle of wine with that cheese. She did say it worked sometimes. She didn't say how or in what direction, did she? Good one. Love it. Great job, Perry. And thanks for taking me back 30 years to my high school french class! My best line will always be Je ne sais pas! Nothing like a good laugh as I read stories and make granola. Too early to get out the wine (although I can already hear you saying it's never too early) but I will be studying a bit of French later. I think your story's grate and not at all cheesy! It works inwards rather than up or down, much to the chagrin of our hapless hero, who for once is happily not me! Thank you,Rochelle. Always happy to take anyone back, I'm not so good at taking anyone forward. Most of the French I remember is unprintable, I'm afraid. Yes, it provided a great musical clip and no laughs! That is not the way to get to Carnegie Hall. But thanks. Yes, but his loss is another man's cheese dip. Yes, and I was happy to parody the French without a single reference to rudeness to tourists. Although I guess chopping an American into little pieces could be interpreted as a bit rude. You're right. Thereafter Albee was frequently referred to as "The Grated One." Say it fast and it sounds better than it is. You know I intended this story to be read along with granola.You understand me perfectly, Janet! I'm trying to match ya for goriness, kz, but I've a long way to go! Thanks for commenting. Ha ha!! Of course, that's what this is. A giant cheese grater. I will never see the picture same way now! And now, I will have some wine and cheese, oh, and some bread. We can't forget that! Hahahaha! Nothing cheesy about the story. Fun stuff. I only promised cake. Sorry, but thanks for stopping by, Amy! Only thing cheesy is the new American cheese spread thanks to the giant grater. Hope he's ... I mean ... it's good! Dangerously cheesy, as those old Cheetos commercials used to say. That was a shock - well played! OMG Perry, that was cheesy! I love cheese, but I want none of that cheese. Perry, you always make me laugh, although seven flights of stairs is no joke, especially in the summer. I live up four flights and that's enough. Thank you, glad you liked. And don't forget the new brand of American cheese from the story too! Anything at all is dangerously in your hands, my darling! Thank you. Albee should have played it as well! Yes, I always try for cheesy in all my stories. And to think it was unpaid as well! Perhaps you could get a giant cheese grater for your building and you might be able to feature it in a macabre story or two. I hateto see what kz would do with it! I assume you painted on a pencil-thin moustache and wore a beret while writing this. Trying to appeal to the French chicks, aren't you?